American Funds American Balanced A (ABALX) fund is a popular world allocation balanced mutual fund. This hybrid fund has a decent yield. Balanced fund can be used as the only investment vehicle for investor to invest. Finding the right balanced fund can be difficult. One of the largest and popular hybrid funds is American Funds American Balanced fund. Details review can be found below. The investment objective of this American Funds American Balanced fund is seeking conservation of capital, current income and to provide long-term capital growth or income. This AF fund invests in a broad range of securities such as stocks, bonds. It usually maintains >50% of assets in common stocks and >25% of assets in debt securities, including money market securities. This fund may invest in foreign companies as well. John H. Smet is the lead manager of this American Funds’ fund. He started managing it in January 1997. It was introduced to public in January 1933. Its total net assets are $49.60 billion. It is categorized in the Moderate Allocation fund. The annual expense ratio of ABALX fund is 0.63% and the average expense ratio in the category is 1.03%. There is 0.24% 12b1 fee and 5.75% front-end sales load fee. This balanced fund has dividend yield of 2.14%. It is distributed on quarterly basis. The latest dividend was distributed in September 2011 ($0.10). This AF American Balanced Fund has 3-stars rating and Silver rating from Morningstar. This moderate allocation balanced fund has YTD return of 3.48%. It has recorded 56 years of positive return and 21 years of negative return. The best yearly returned was achieved in 2003 with 22.82%. The fund has returned 1.01% over the past year and 4.88% over the past decade. The fund 3-year beta is 1.05. The fund’s benchmark is Lipper Balanced Funds Average. This popular balanced fund requires a minimum initial investment of $250 for opening a brokerage or IRA account. Investors will need to hand in a minimum of $50 for the subsequent investment. There are 74 brokerages that provide this fund, such as Merrill Lynch, JP Morgan, Schwab Retail, Scottrade Load, Royal Alliance, TD Ameritrade Inc, E Trade Financial, Firstrade, Raymond James, etc. There are some other classes available for this American Balanced Fund, like Class B (BALBX), Class C (BALCX), Class F-1 (BALFX), Class F-2 (AMBFX), Class 529-A (CLBAX), Class 529-B (CLBBX), Class 529-C (CLBCX), Class 529-E (CLBEX) and Class 529-F-1 (CLBFX). As of October 31, 2011, the top 10 largest equity holdings are Chevron (3.0%), Wells Fargo (2.2%), Union Pacific (2.1%), Royal Dutch Shell (1.9%), Philip Morris International (1.9%), Goldman Sachs (1.8%), Home Depot (1.7%), Amazon.com (1.7%), American Express (1.7%) and Merck (1.6%). 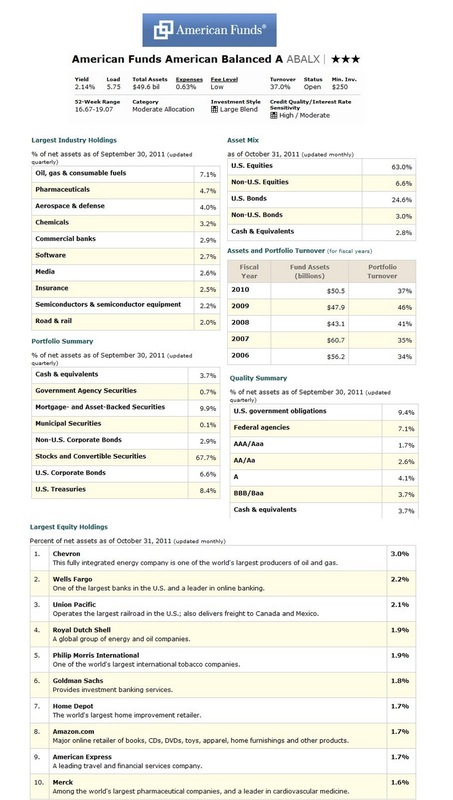 The largest portfolio summary based on the net assets percentage as of September 30, 2011 is Stocks and Convertible Securities (67.7%). thinly traded securities risk, foreign investment risk, management risk, etc.